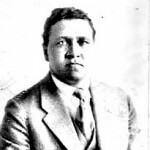 February 1, 1882 Channing Heggie Tobias, civil rights activist, was born in Augusta, Georgia. Tobias earned his Bachelor of Arts degree from Paine College in 1902 and his Bachelor of Divinity degree from Drew Theological Seminary in 1905. For the next six years, he taught bible literature at Paine College. In 1911, Tobias joined the YMCA where he held various positions in the organization’s Colored Work Department. After leaving the YMCA in 1946, he became the first black director of the Phelps-Stokes Fund, a foundation devoted to the improvement of educational opportunities for African Americans. He retired from that position in 1953. Tobias also served on the board of the NAACP, serving as chairman in 1953. Also in 1953, Tobias served as an alternate representative to the United Nations for the United States. Additionally, he served on the boards of Hampton Institute, Palmer Memorial Institute, and the American Bible Society. He received the NAACP Spingarn Medal in 1948. Tobias died November 5, 1961.